Small and soft objects, e.g. bean-bag and towel. To train the body balance of children. To train the limb coordination of children. Let parents and their children place small objects over different body parts, e.g. head, elbow and foot. Demonstrate different balancing movements, e.g. raising arms and standing with one leg, which prevent the objects on the body from falling down. Help children pose different balancing movements and support them with hands in order to prevent them from falling down. 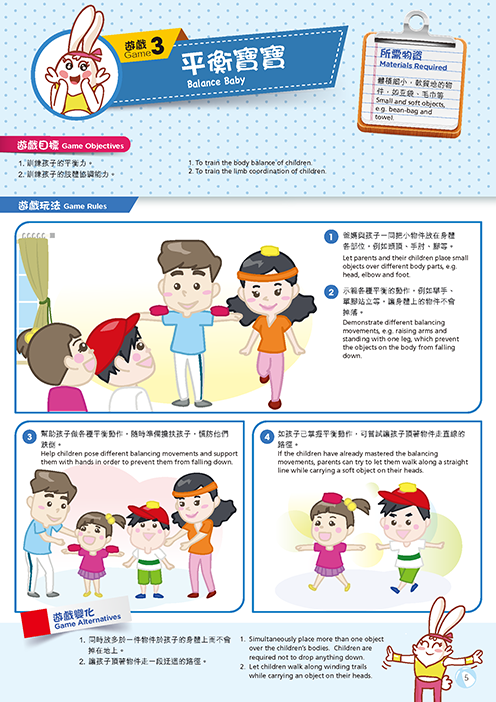 If the children have already mastered the balancing movements, parents can try to let them walk along a straight line while carrying a soft object on their heads. Simultaneously place more than one object over the children's bodies. Children are required not to drop anything down. Let children walk along winding trails while carrying an object on their heads.